Last week, an eagle-eyed Reddit user noticed that a trailer for the upcoming sci-fi thriller Life, which hits theaters on March 24, recycled a brief shot from Spider-Man 3. This lead other users on Reddit to concoct a theory that Life may actually be a secret prequel to the Venom spin-off. That the alien creature featured in Life is the symbiote that eventually becomes Venom. While this theory is far-fetched, since there are no confirmed ties between Life and the Marvel Comics universe, the team behind Life have taken a surprise stance on this idea. Now the writers and their director refuse to deny this outlandish rumor. ComicBook.com attended a recent press event where Life writers Rhett Reese and Paul Wernick, who also wrote the R-rated superhero blockbuster Deadpool, were asked about this theory. Paul Wernick claimed that "We are tied to Venom!" Rhett Reese pointed out that, while the Venom movie was previously in development at Sony, the writing team had written a script for the Venom movie, which some fans took as more evidence to support the outlandish theory. Here's what Rhett Reese had to say about why this theory came to be. "We wrote a Venom screenplay, so I think people saw that connection. They also saw the Spider-Man 3 footage that sneaked its way into our last trailer. They just announced a Venom movie release date just yesterday." Still, the writers didn't deny this theory, and neither did director Daniel Espinosa during a new interview with Collider. Why Sony has denied that this fan theory is not true, supposedly 'debunking' it, Espinosa wasn't so quick to write it off. He says this, in a supposedly joking manner. Related: Did This Life Trailer Just Recycle Spider-Man 3 Footage? "I found out three days ago, The Sony picture people took me aside, they took me into this dark room, and they showed me this different angle, where JFK got shot. They then said, 'We are the people in power. You have made the prequel to Venom.' And I'm like, 'F*ck!' There's nothing to do about that, you know?" Pressed for his actual thoughts on the Venom fan theory, Espinosa went onto say this. "I'm a great Venom fan. I'm the fourth biggest comic book buyer of Sweden. And I am a Marvel fan. Do you know what it means to me, when I go back to my comic book shop, that I did the prequel to Venom? I'm the coolest person in the comic book shop." Things get interesting when asked if he can state outright that the fan theory is 'complete bullish*t'. His answer is quite surprising. "I'm not commenting on anything! I'm the coolest guy in my comic book shop. That's all that matters to me." The Venom character was created in 1988 by David Micheline, with artwork provided by Todd McFarlane and Mike Zeck. Venom is an alien symbiote that needs a human host to survive, which provides the human with incredible powers. The character was originally conceived as a villain, but he became an anti-hero and almost a bona fide good guy in a lengthy stretch of the comics. The current Marvel Comics portray Eddie Brock/Venom as a villain who has teamed up with Flash Thompson, Peter Parker's old high school nemesis who now works as a government agent. Despite the lack of denials, it still seems unlikely that there is a connection between Life and this new Venom movie, but there have been a few instances where studios have surprised fans. The new thriller Split ended with a surprise scene that set up a connection with another one of M. Night Shyamalan's films. Paramount has also surprised fans in the past by revealing that a small-budget indie previously known as The Cellar would be re-titled 10 Cloverfield Lane, which connects to the Cloverfield universe, as does the upcoming God Particle. Just last fall, Lionsgate unveiled that a horror-thriller entitled The Woods was actually entitled Blair Witch. 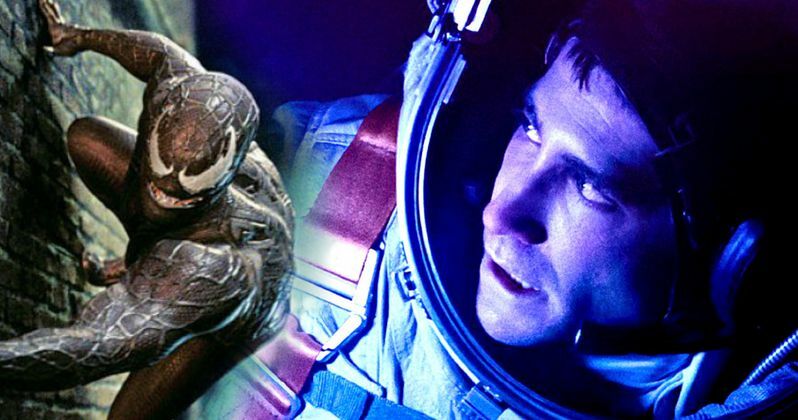 Even with all of these recent examples, it seems unlikely that the alien featured in the Life movie has any connection to the new Spider-Man franchise, which kicks off with Spider-Man: Homecoming on July 7. As for Venom, Alex Kurtzman will be directing the spin-off, which has been given an October 5, 2018 release date.